Camo style caps are all the rage with the younger generation. If you operate in the outdoor market, offering camping tours, hikes, team building venues, manufacturing tents and related industries, these caps make awesome promotional fashion accessories to offer to visitors. Hand them out at product launches, trade fairs, expos and outdoor shows. Your brand is certain to get maximum exposure around people most likely to buy your products. The cap has a classic structured 6 panel design with a pre-curved peak. It is made from a cotton twill which is a woven fabric. Soiling and stains are less noticeable on woven fabrics and they are also more durable than non-woven fabrics. All our caps are made to the highest standards using only the best quality materials. Seams are double stitched for strength and long life. 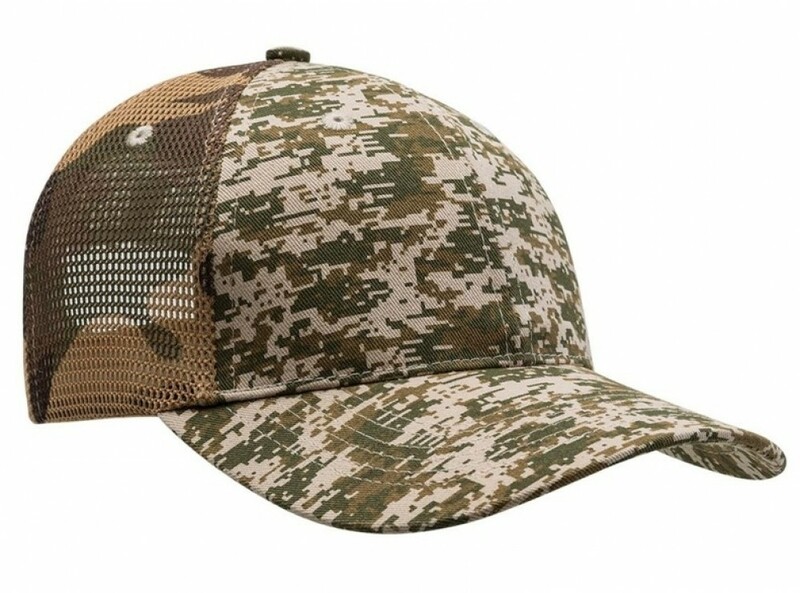 This design features a digital camouflage pattern on the front panels and has a match camouflage colours on the nylon mesh sides and back. The mesh allows for breathability, ideal for outdoor activities in hot weather conditions. A padded sweatband adds extra functionality. Speak to our friendly team, we have great ideas for helping you create a great advertising campaign.